The greenback has been recovering from the latest collapse and the GBPUSD pair briefly dipped below the 1.40 mark during the London session, losing 0.60% on the day. Later in the evening, the BOE Governor Mark Carney is due to testify before the House of Lords Economic Affairs Committee in London, which might bring further volatility to sterling pairs. From the US dollar perspective, traders will focus on the consumer confidence gauge, which is expected to tick higher to 123.2 from 122.1 in the previous month. However, this number rarely has an impact on the greenback. 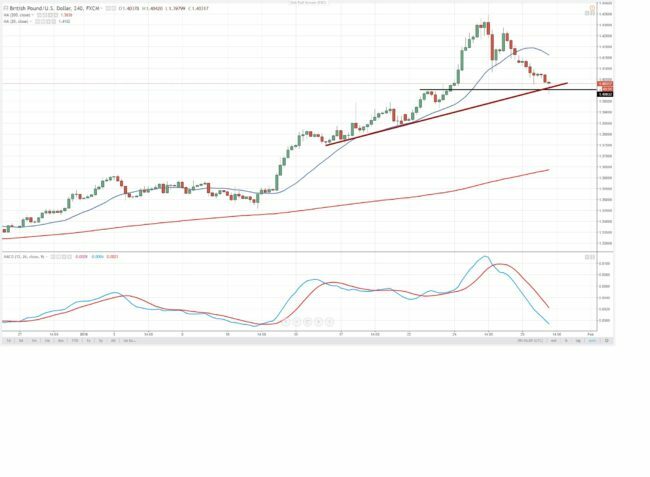 The GBPUSD pair is now testing the first major support of the psychological level near 1.40, where the short-term bullish trend line is converged with previous highs. If not held, further decline toward the 1.39 level might occur and a consolidation phase might begin. The resistance for today’s trading is located around 1.4050 and if bulls will be stronger, the 1.41 handle might be the next target. In all cases we strongly recommend to have rigorous money and risk management.